Billy will perform at Kempinski Hotel Bahia, Estepona, Costa del Sol, Spain on the 24th of January 2019 at 19:30, hosted in the Arts Foyer on the 4th floor. All tickets have a cost of 20€ and spaces are limited. –The entry includes a welcome drink. Tickets are available at Kempinski Hotel Bahia reception and via email through marketing.estepona@kempinski.com. The price is 20€ per person, and groups of 6 or more will receive a complimentary ticket. Billy O’Brien enjoys an active career as soloist and chamber musician. He made his concerto debut with the RTÉ Concert Orchestra in 2016 playing Gershwin’s Rhapsody in Blue. After which his career took him to play at the National Concert Hall in Dublin and the National Opera House with Wexford Sinfonia. He has recently given solo recitals at the New Ross Piano Festival, the National Gallery Dublin, and was invited to perform at the Irish Embassy, Paris. 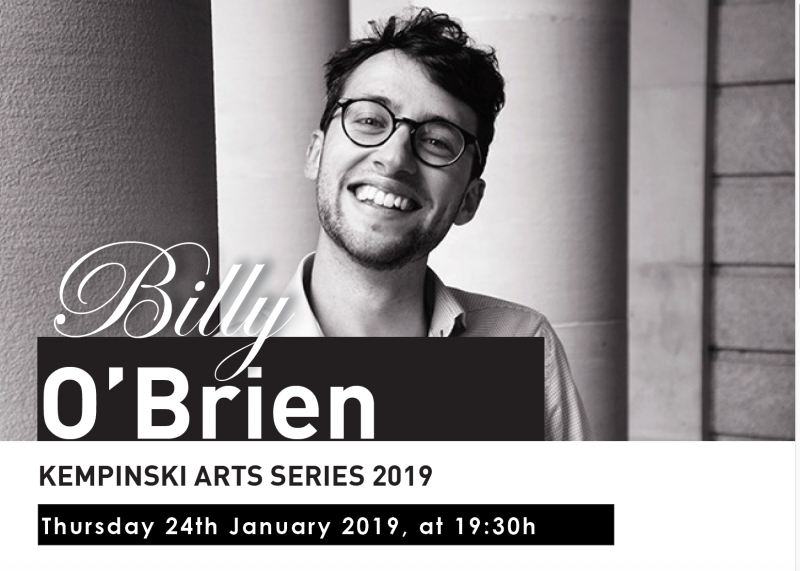 In addition, Billy has collaborated with leading contemporary music ensemble, Kirkos, and the Killeena Ensemble, performing concerts in Turku, Finland; participated in many masterclasses and festivals, including the Engadin International Piano Academy, and the Clandeboye Festival (Belfast). Nestled in Estepona – Marbella, Spain, and celebrating its 20 anniversary in 2019 is a breathtaking luxury frontline beach resort with 145 rooms (including 17 suites) overlooking the Mediterranean Sea and Hotel with subtropical gardens and pools, and also features a meeting & events center, trendy culinary concepts, and an exclusive Kempinski Spa.